1. the act of piercing or penetrating with a pointed object. 2. a wound so made. cisternal puncture see cisternal puncture. lumbar puncture (spinal puncture) see lumbar puncture. sternal puncture see sternal puncture. tracheoesophageal puncture surgical creation of a tracheoesophageal fistula to hold a one-way plastic valve to restore speech after Laryngectomy. a surgical procedure to restore vocal function in patients who have had a laryngectomy by creating a tracheoesophageal fistula through which the laryngectomee forces air from the trachea into the esophagus to produce sound that is articulated into speech. 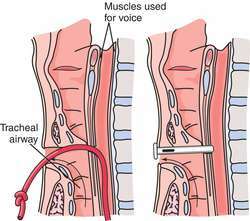 a one-way synthetic valve placed in a surgically created tracheoesophageal fistula to restore speech after laryngectomy. Surgical procedure connecting the trachea and esophagus. In laryngectomies, the puncture, in combination with a prosthetic valve, allows exhaled air from the lungs to enter the esophagus for production of speech. Synonym(s): tracheo-oesophageal puncture, tracheo-oesophageal shunt.